I am in the mood for pizza at least once a week; unfortunately, whenever we order delivery, I always regret it two bites in because it seems so greasy. 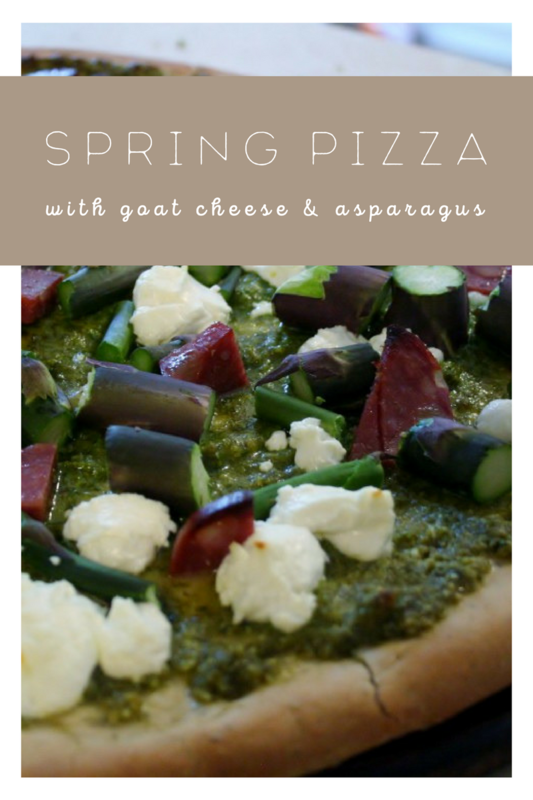 I decided that even if I don’t make my own pizza crust, homemade would be better in terms of taste and health – so here it is, a spring pizza that tastes great and has less grease. This pizza recipe was inspired by Primavera Pizza, a recipe I found in The Gardener & the Grill: The Bounty of the Garden Meets the Sizzle of the Grill . I say inspired by because I didn’t make it on the grill, or follow the directions and swapped out some ingredients – but that’s the great thing about pizza, it’s very flexible. If you are short on time you can purchase pesto. However, I’ve found making your own pesto is super easy and a great way to use up extra herbs and greens that you might have from your garden. For pesto: Add chives, parsley, Parmesan cheese, pine nuts, olive oil, and lemon juice in a food processor and blend to desired consistency. Spread the pizza crust with pesto. (Use your favorite recipe or purchase a premade crust). Bake at 400F for about 12 minutes. The Verdict: The original recipe called for grilling the asparagus first, but I rather liked the little bit of crunch that was left after baking with the pizza. This was incredible, and it was fun knowing that I went out and picked the chives and parsley for the pesto minutes before dinner. The asparagus was from my dad’s yard. And the goat cheese was made by my friend Veronica, who owns a local creamery. The mix of ingredients was very satisfying and tasted awesome. It’s Autumn here but I’d be happy to eat that pizza! Hi Wendy, your pizza looks great! We have pizza every Friday night, but last Friday, we went out. Maybe I should make it tonight for Sunday supper. Thanks. What a gorgeous pizza you created Wendy, love that all the ingredients were homemade and fresh, very nice. my favorite way to do pizza! I’m jealous that you already have herbs and asparagus in your neck of the woods. It will be another 2 months before it is ready here. Oh my! That looks absolutely delicious. Love the Asparagus!! YUM! I’m always up for new pizza combos. Loving it!